PROCTORVILLE, Ohio — Gallia Academy took the fifth. 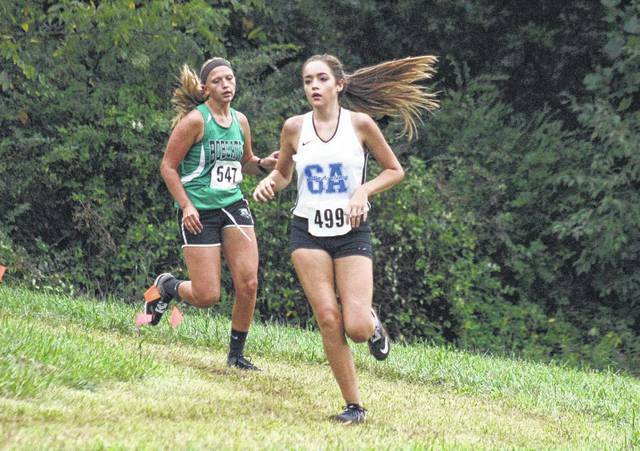 That’s because the Blue Devils and Blue Angels both finished fifth on Saturday as part of the 14th annual Fairland Dragons’ Run by the River cross country invitational. There were a dozen boys squads which posted team scores, as the Blue Devils placed fifth with a team total of 119. The Blue Angels also ended up fifth, as their team score was a 126 with 11 total teams earning points. For the Blue Devils, senior twin brothers Caleb Greenlee and Kyle Greenlee crossed the finish line back-to-back in fourth-place and fifth-place respectively. Caleb Greenlee completed the 5K course in 17 minutes and 34 seconds, while Kyle Greenlee crossed the line just 12 seconds later (17:45). Elijah Miller of Boyd County in 17:08, Ethan Lafon of Fairland in 17:23 and Aidan Judd of Waverly in 17:30 were the only individuals to place ahead of the Greenlees. The other five Blue Devils which scored all placed from 35th to 56th, as Kobe Cochrane (35th in 19:48), Ezra Blain (39th in 19:57) and Ethan Rider (42nd in 20:02) registered the other three counting times. Gallia Academy’s other two scores were by Grant Smith (54th in 20:31) and Tristan Crisenbery (56th in 20:44). Rock Hill captured the team championship with a score of 45, as Boyd County (79), Fairland (80) and Waverly (83) were the next three clubs ahead of the Blue Devils (119). Hurricane had a team score of 144 to complete the upper half of the 12-team field. Rounding out the boys team scores were Wheelersburg (239), Spring Valley (254), Ironton (255), Ashland (273), Coal Grove (277) and Symmes Valley (342). There were 149 runners in the boys high school race. The Blue Angels also enjoyed a pair of top-six spots — as freshman Sara Watts was third overall in 21 minutes and three seconds. Brooke Johnson finished sixth for Gallia Academy in 21:35, as Ashland landed three of the top five spots, including individual champion Rebekah Howard in 20:09. Gallia Academy’s other individual scorers included Abby Johnson (32nd in 24:46), Abby Cremeans (41st in 26:08), Maddie Stewart (62nd in 28:05), Cassidy Starnes (67th in 28:42) and Karsyn Shamblin (78th in 30:01). There were 113 runners in the girls high school race. Ashland amassed a team score of 36 to claim the championship, followed by host Fairland (51) Boyd County (99) and Waverly (120) immediately ahead of the Blue Angels (126). Once again, Hurricane had the sixth-best score, which was a 183. Rounding out the girls team scores were Spring Valley (194), Rock Hill (231), Ironton (239), East Carter (260) and Symmes Valley (314). Visit www.baumspage.com for complete results of the 2017 Fairland Run by the River meet. Gallia Academy’s Abby Johnson (499) runs in front of Green’s Megan Johnson (547) during the Coach’s Corner Classic on Sept 5 in Centenary, Ohio.